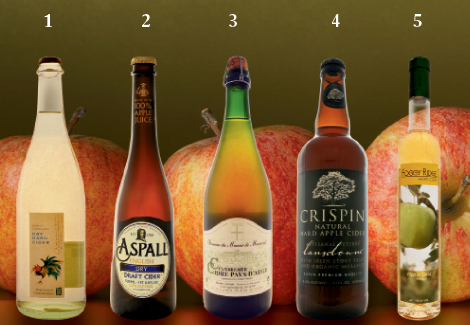 To celebrate the apple harvest, go with a fermented wine that deviates from the vine. England and France are known for their bottled effervescent ciders, and in recent years American cider works have begun earning fine reputations as well. Here’s a sampling of offerings, from dry to sweet, to accompany you from appetizers through dessert. Delightfully sharp and effervescent, this dry hard cider is fashioned from heritage mountain apples to emulate Brittany’s traditional, brilliantly clear, but poignant, beverage. Pair it with sharp cheddar cheese or a baked gratin. With depth and complexity that comes from russet apples, this flavorful, straw-colored beverage is a product of the 275th year of Suffolk Cyder production. Particularly floral with a mouth-filling mousse, this bottle can be enjoyed as an apéritif or an accompaniment to roasted pork. A classic beverage from Normandy, the apple basket of France, this slightly sweet cider is a perfect foil for Camembert cheese or buckwheat crêpes. Or, try it with chicken braised in cream and apple brandy. Intended as a bold aperitif or dessert complement, this 18 percent blend of cider and apple brandy will knock your socks off. Enjoy it with peach or apricot pie, or cheeses, including Gorgonzola, Roquefort, and aged Gouda.